Aleš Kot (ZERO, DAYS OF HATE), Tradd Moore (LUTHER STRODE), and Heather Moore come together for THE NEW WORLD—a ballistic sci-fi action romance mini-series set to launch this July. PORTLAND, OR, 5/29/2018 — Aleš Kot (ZERO, DAYS OF HATE), Tradd Moore (LUTHER STRODE), and Heather Moore come together for THE NEW WORLD—a ballistic sci-fi action romance mini-series set to launch this July. 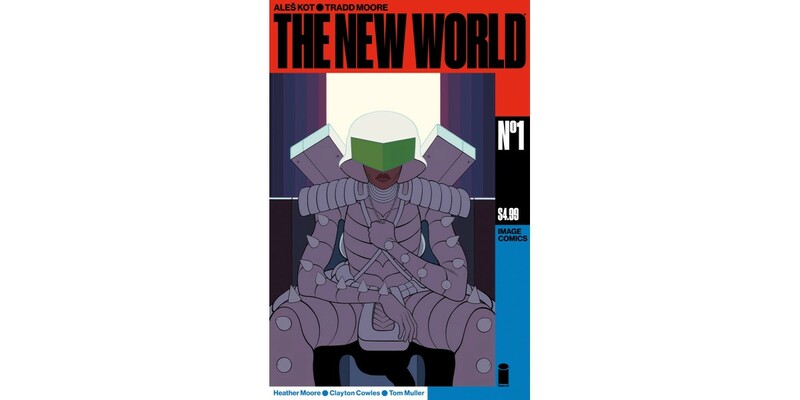 THE NEW WORLD #1 begins with a massive-sized, 72-page debut issue, and features a backup comic introducing the talents of Aaron Stewart-Ahn and Sunando C.
Set in The United States of America—after the Second Civil War—THE NEW WORLD follows two lovers. One: a straight-edge vegan hacker anarchist boy with a penchant for messing with the State. The other: a chaotic, hedonistic cop with a reality TV show and a license to kill. This really shouldn't happen—and yet, somehow, it does. Soon, the entire state of New California is after them—so they have to run.